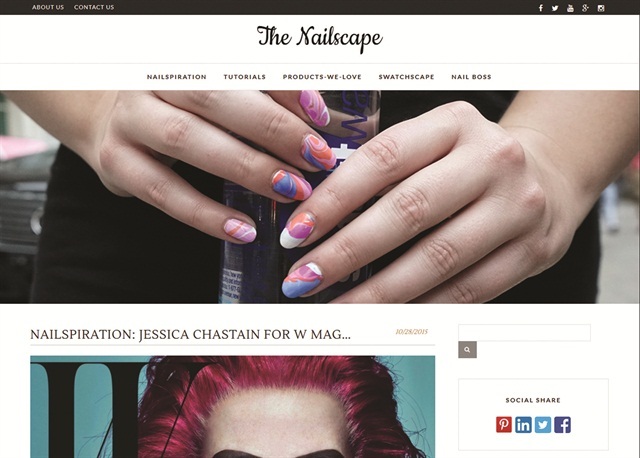 Nail tech Ashley Gregory has long been involved in making industry news, but now she is reporting it too, via her new blog, The Nailscape (www.thenailscape.com). She decided to launch the Nailscape in order to coincide with her trip to New York Fashion Week last September. While there, Gregory began the ambitious task of shooting street-style nails outside the venues, garnering a lot of attention. “I live in the world of session work, and am always asked how I got into that line of work by nail pros,” says Gregory. “There are a million hair and makeup blogs that focus on every aspect of professional hair and makeup artists, but I haven’t seen one yet for nails. When I’m on set, I’m always dispelling myths about nail care and teaching models how to take care of their nails. I was often asked why I don’t have a blog, so I figured better late than never.” Her goal for The Nailscape is for it to be a destination for nail news, industry information, independent professional reviews, and nail inspiration along with profiles on industry influencers and features of amazing nail work. Gregory, who already has a full schedule, relies on her team, including Diane Diaz of Canvas Nail Studio in Chicago to assist her on shoots, at NYFW, and with swatching and reviews. You can follow The Nailscape on social media @TheNailscape.